Made with High Quality Mongolian Faux Fur That Provides the Best Touch and Feeling. 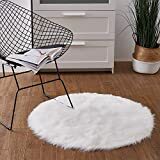 Faux Fur Area Rug Used for Both Chair Seat Cushion or Bedroom Living Room Decor. Clean with Damp Cloth, Flat Dry.